• Upon vacating property, pest eradication may be performed to both the interior and exterior of the premises, including but not limited to fleas, by a licensed pest control company approved by Monterey Bay Vacation Rentals. Bayview Cottage was exactly what I needed during my transition from LA to Monterey. I stayed for a month and it was perfect! I had my friend and out two dogs with me and the yard size was perfect to let the dogs out to explore and tucked enough away from the street to not have to worry. The beds were a little bit hard and there weren't a lot of extra blankets and such, so if you run cold - bring some with you! At night we could hear the sea lions in the bay and lovely music filtering up the hill. Overall, the location was convenient, close to nearby shops and restaurants and attractions. The deck was amazing with ocean views as well. The only thing that would have made this place better was a hot tub! You’ll be spending lots of time outdoors at Bayview Cottage: the spacious deck is like a second living room with all-weather wicker furniture (sofa, chairs, and dining for six). Inside, there’s a large flat screen TV with BluRay DVD player, and a remodeled kitchen with black galaxy granite and new high-end stainless appliances, including a five-burner gas range. The master bedroom has Queen bed and a petite private bath with a stall shower lined with mosaic tile. Two other guest rooms (one Queen, one with twin trundle beds) share a hall bath with a tub/shower. There’s a two-car garage (with a washer/dryer) downstairs. This quiet neighborhood is just a splash away from Cannery Row (restaurants, shops and the Aquarium—it’s a great central location for enjoying all the delights of the Monterey Peninsula. The deck is like a second living and dining room. The Monterey Aquarium is just down the street. "Cottage' is a three-bedroom gorgeous house, well located in Monterey (sometimes called New Monterey because it us between Pacific Grove and downtown Monterey). Alone most of the month for study and quiet, beautiful deck, view of the ocean, trees aurrounding house are beautiful. Last weekend brought family down, and everyone fit perfectly. Clean and well furbished and everything works! HIghly recommend. Bayview Cottage was exactly what I needed during my transition from LA to Monterey. I stayed for a month and it was perfect! I had my friend and out two dogs with me and the yard size was perfect to let the dogs out to explore and tucked enough away from the street to not have to worry. The beds were a little bit hard and there weren't a lot of extra blankets and such, so if you run cold - bring some with you! At night we could hear the sea lions in the bay and lovely music filtering up the hill. 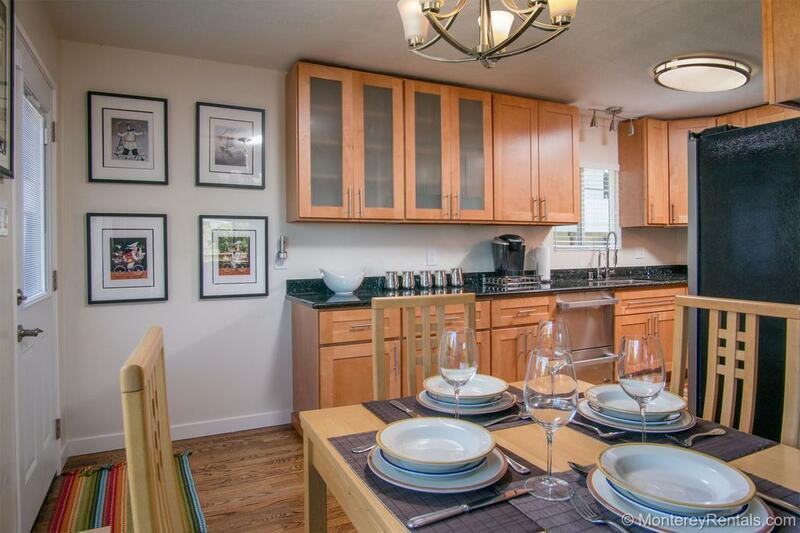 Overall, the location was convenient, close to nearby shops and restaurants and attractions. The deck was amazing with ocean views as well. The only thing that would have made this place better was a hot tub! Bay view Cottage is very comfortable and well situated on the peninsula. We enjoyed the spaciousness and the comfort of the rooms. The deck is great! The wifi needs updating as it is very slow....but we were on vacation so we weren't in a hurry! All in all I would highly recommend this unit. We're glad you enjoyed the Bayview Cottage; we sent a tech as soon as you reported the slow internet speed - it's "up to speed" now (super fast, in fact! ).